Document3D has a new 3D PDF Module that lets you create PDF files with 3D illustrations. What’s new is that Document3D now imports 3D CAD models directly — no need to create intermediate U3D files, which is the format PDF uses to store U3D files. Document3D software is meant for capturing and creating design metadata, step-by-step instructions, bill-of-materials and other product information in final 3D-enabled Adobe PDF documents. You can download a free demo from QuadriSpace Corporation’s Web site. From the IntelliCAD Explorer, you can use the Dimension Styles element to cut, copy, and paste dimension styles from one drawing to another. NOTE You can select the dimension style and use the Microsoft Windows shortcut keys (Ctrl+A to select all, Ctrl+X to cut, Ctrl+C to copy, Ctrl+V to paste) to accomplish the same results. You can use these shortcut keys with all other IntelliCAD Explorer elements as well. Although you cannot control these settings from within the IntelliCAD Explorer, you can use the Dimension Settings dialog box to control settings related to the appearance of arrows, lines, text, units, and other formatting characteristics. â€¢ Choose Settings > Explore Dimension Styles. â€¢ Type setdim and then press Enter. What they call “subscription licensing” is a truer version than most other CAD vendors. CoCreate lets customers to rent the software on an annual basis; other vendors expect you to pay the full amount of the software, and then tack on the annual subscription fee. You can save a block as a separate drawing, and then you can open and modify that drawing as you would any other drawing. â€¢ Choose Settings > Explore Blocks. â€¢ On the Settings toolbar, click the Explore Blocks tool. â€¢ Type expblocks and then press Enter. you want to save the block. You can attach another drawing to the current drawing as an external reference and insert a copy of the drawing into the current drawing. The name of the external reference drawing is added to the Block Name list. Changes made later to the referenced drawing will appear in this drawing when you reload the external reference. drawing you want to attach, and then click Open. 4 In the drawing, specify the insertion point. angle, or in the prompt box, select Done. 2 Click the path you want to change. you want as the external reference. You can insert as a block another drawing into the current drawing. After you do this, the block name is added to the Block Name list in the IntelliCAD Explorer. Changes made later to the inserted drawing will not be reflected in this drawing. to insert, and then click Open. or in the prompt box, select Done. The complete three part series Dynamic Blocks Best Practices Series is now complete and online. You can insert into a drawing any block listed in the Block Name list in the Intelli- CAD Explorer. This includes blocks contained within any open drawing. 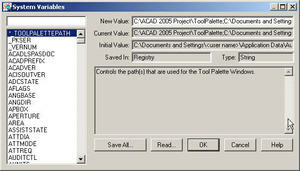 4 On the IntelliCAD Explorer toolbar, click the Insert tool. 5 In the drawing, specify the insertion point. NOTE You can also insert a block by choosing Tools > IntelliCAD Explorer, and then double-clicking the name of the block you want to insert in the Block Name list. More AutoCAD Setvar Tips to Increase your Productivity! I’m on my way to Chicago for a couple days of meetings where I’ll get to talk briefly about User Groups (one of my favorite topics!). Just watched "Monster-In-Law" on the plane which was good enough to pass the time and thought I’d finish off the flight by sharing some more AutoCAD system variables with you. Thanks so much for all the positive feedback on my movie reviews – I’m sure the San Francisco Chronicle will be calling me soon to add me to their entertainment staff! LOL! Fine tuning the system variables in AutoCAD can make a world of difference to your productivity. You’ll want to make sure you set them up precisely to your liking. And after you’ve set your system variables up just right – be sure to save them out to a file in case you need to reinstall AutoCAD, or you accidentally do something that resets them (or perhaps someone else does that for you!). UCSFOLLOW: You 3D users may have discovered that your view automatically updated to reflect the new plan view whenever you change your UCS in AutoCAD 2005 and AutoCAD 2006. Surprise! If this new setting is not to your liking simply turn UCSFOLLOW to off. SNAPBASE: The best use for SNAPBASE is controlling the origin point for your cross-hatching in releases prior to AutoCAD 2006. Simply set the SNAPBASE to the location where you’d like your hatching to begin. AutoCAD 2006 added in a option to the BHATCH command that let’s you easily control the origin for hatch patterns so you AutoCAD 2006 users can ignore this one!